Dopamine transporter with an antidepressant drug (yellow), sodium ions (magenta) and a chloride ion (green). Nerve cells communicate with one another in two ways. Some neurons send an electrical signal directly to their neighbors, which is very fast. Most neurons, however, use chemical signals to transmit their messages, releasing small neurotransmitter molecules that are recognized by receptors on neighboring neurons. Neurotransmitters have two important advantages: since thousands of molecules are released, they amplify the signal, and since many different types of neurotransmitters are used, they can encode a variety of different types of signals. Once neurotransmitters have delivered their message, they need to be cleaned up, to get the neurons ready for the next signal. This is the job of neurotransmitter transporters. They are found in the membrane of the neuron or in associated cells. They transport the neurotransmitters out of the narrow synaptic cleft between the nerve cells, powered by the simultaneous transport of sodium and chloride ions. The transporter shown here, from PDB entry 4m48 , transports the neurotransmitter dopamine. Since they are so centrally involved in nerve transmission, these transporters are the target of drugs that affect thought and mood. Drugs that block the action of the transporter will cause the neurotransmitter to remain in the synapse longer than normal. Antidepressant drugs (such as the one shown here in yellow) take advantage of this by blocking dopamine transporters. Drugs of abuse like cocaine also block the action of these transporters. 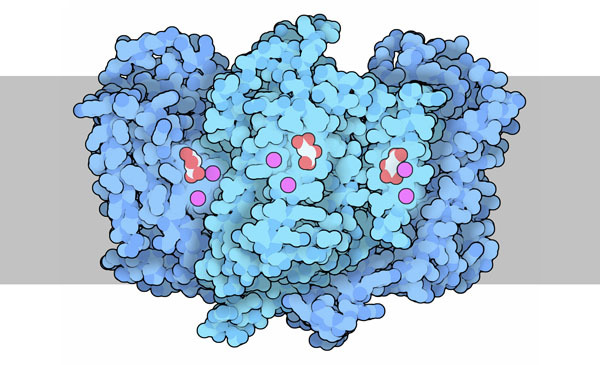 Bacterial aspartate transporter with aspartate (white and red) and sodium ions (magenta). Neurotransmitter transporters have been difficult to study by x-ray crystallography, but structures have been obtained for several bacterial transporters with very similar function. These transporters import neurotransmitter-like nutrient molecules into the bacterial cell, powered by the co-transport of sodium ions. The one shown here, from PDB entry 2nwx , transports aspartate, and is an analogue of the glutamate transporter that is found in most of the excitatory synapses of your brain. Another well-studied bacterial transporter, which is related to the dopamine transporter, has revealed several of the steps in the molecular pumping cycle. Three structures are shown here: one that is open to the outside of the cell, one with a molecule and several ions caught in the middle of being transported, and one that is open to the inside of the cell (PDB entries 3tt1 , 3f3e and 3tt3 ). Several alpha helices, shown here in bright turquoise, form a tunnel with a constriction at the center that performs the specific pumping task. 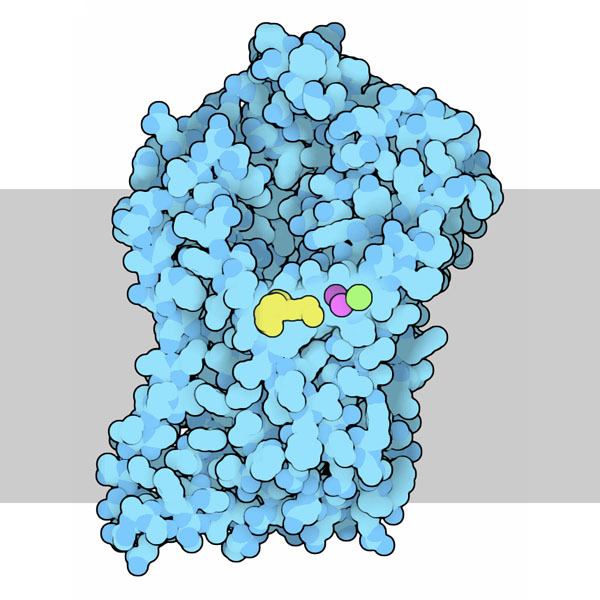 To see an animation of this protein in action, click on the image for an interactive Jmol. Try using one of the 3D viewers at the PDB to look at the specific interactions between transporters and the molecules that they transport, for instance, the aspartates bound in the transport site of PDB entry 2nwx. The function of the dopamine transporter is modulated by cholesterol--you can see how it binds in PDB entry 4m48. P. J. Focke, X. Wang & H. P. Larsson (2013) Neurotransmitter transporters: structure meets function. Structure 21, 694-705. 4m48: A. Penmatsa, K. H. Wang & E. Gouaux (2013) X-ray structure of dopamine transporter elucidates antidepressant mechanism. Nature 503, 85-89. 3tt1, 3tt3: H. Krishnamurthy & E. Gouaux (2012) X-ray structures of LeuT in substrate-free outward-open and apo inward-open states. Nature 481, 469-474. 3f3e: S. K. Singh, C. L. Piscitelli, A. Yamashita & E. Gouaux (2008) A competitive inhibitor traps LeuT in an open-to-out conformation. Science 322, 1655-1661. 2nwx: O. Boudker, R. M. Ryan, D. Yernool, K. Shimamoto & E. Gouaux (2007) Coupling substrate and ion binding to extracellular gate of a sodium-dependent aspartate transporter. Nature 445, 387-393.